Members of the Lawton Northeast Lions Club, along with Joy Chapman of Perry Broadcasting and the Boy Scouts and Leaders from Troop 187 from Fletcher/Elgin, attended the Lawton City Council meeting on Tuesday, April 12th. 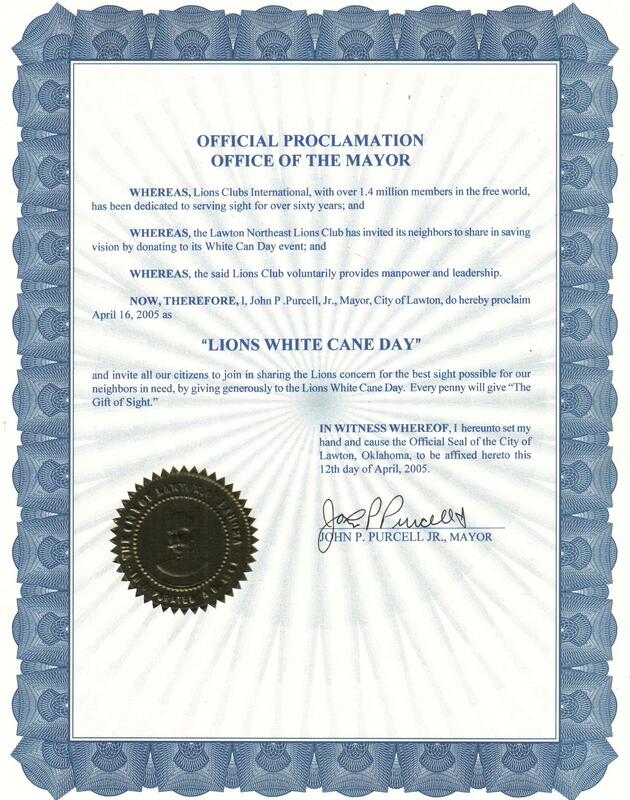 The Mayor of Lawton, John Purcell, officially proclaimed April 16th, 2005, as Lions White Cane Day in Lawton, Oklahoma. Scout Leader Michael O'Rourke, Lion Joe 'Wo Wo' Wotring, and Nikki Foxx from K98 JAMZ. Lion Joe "Wo Wo" Wotring with Boy Scouts from Troop 187. Lion Lynette Carter, flashing a 20 dollar donation for White Cane Day. Lions Claudie "The Man" Lott and Cory Chatman (Grandson of the late singing Sergeant Major, Lion Gene Day) at Sam's on White Cane Day. Members of the Lawton Northeast Lions Club, along with the Boy Scouts and Leaders from Troop 187 from Fletcher/Elgin, attended a Lawton City Council meeting on April 11th, 2006. The Mayor of Lawton, John Purcell, officially proclaimed April 15th, 2006, as Lions White Cane Day in Lawton, Oklahoma. The Lawton Northeast Lions Club teamed up with Wal-Mart, Sam's, Perry Broadcasting's K98 JAMZ radio station, and the Boy Scouts of Troop 187 and Pack 185 from Fletcher/Elgin to conduct our annual White Cane Day fundraiser event on Saturday, April 15th. Airgas provided the air tanks for the balloons. It was a great day!